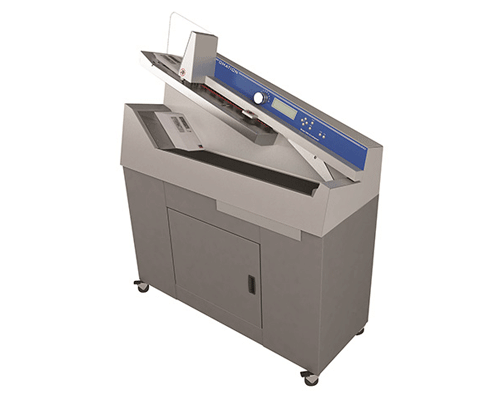 The IM-306, with its ability to operate at a rated speed of up to 40,000 envelopes per hour, contains the latest mail opening technology setting a new standard for high volume mail processing. Using milling cutter technology with 8 cut-depth positions removes chips as small as 0.01” from the envelope edge, producing a soft, feathered edge while protecting valuable envelope contents. Even overnight delivery envelopes are no match for the Model 306. Equipped with a robust operator control software interface, job setup can be done with ease and flexibility. Most significantly, the IM-306 is also available with enhanced sorting capabilities as the IM-306s. Envelopes can be output to two locations based on programmable criteria such as thickness, length, and height. Optional batching capability allows items to be grouped together in pre-selected lot sizes. Sorting options make the IM-306s a perfect fit for applications that require verification of contents either before or after extraction like claims processing, remittance, and vote-by-mail. Because of its ability to identify “clean mail” from “exception mail,” the Model 306 also helps to insure maximum productivity from mail extraction equipment by allowing operators to concentrate on extracting envelope contents from “clean” batches instead of trying to handle exceptions at the same time.